Because we stayed an extra day in El Geneina in Sudan, we had to cross the border on 26 October, the day our visas expired. We were told it was four hours to Abeche in Chad, so we had to clear the border by 1pm. We started our attempt at 8.30am, but 'the man with the stamp' was not there, so we had to wait for 2.5 hours for him to arrive. Attempts to hasten his arrival were useless. Once he did arrive, he was quite efficient, and he sent us on to security, where we watched the officer rule lines on the pages of his notebook extremely slowly. It was very frustrating and worse than watching paint dry. To add insult to injury, he then demanded money, the equivalent of $6. Finally we had to go to customs. Our delay was acknowledged, and they seemed to understand the carnet, but when presented with the document to stamp, the customs man decided it was breakfast time, and flatly refused to stamp it before eating. We were invited to join him for the meal, but by this stage we were a little beyond reason, so declined. Finishing the meal, he stamped the carnet, and having ruled columns in his book, laboriously copied all the details, despite keeping the import section of the carnet. 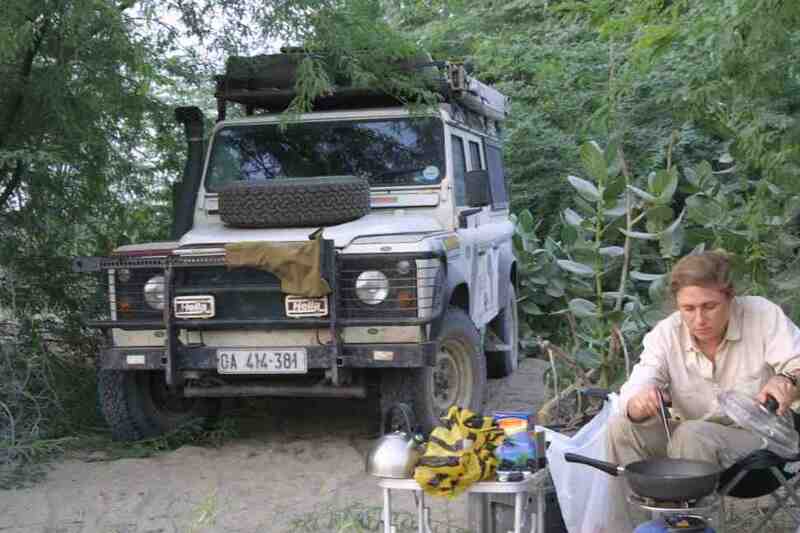 It was now 12.30, and it was a 30 minute drive to the Chad border along a sandy track. The border crossing at Chad was simple. We arrived at Adre and were met by a French soldier (whom we nicknamed Lucky Luke) wearing shades and with a cigarette sticking out of the corner of his mouth. He informed us that the chef had gone for lunch, but would be back immediately, and also that Chad was 2 hours behind Sudan. The chef returned after five minutes and stamped our passports. Customs was a simple stamping of the carnet, although they tried to persuade us to give a lift to a shifty looking character. We refused, and pressed on down a sandy track. 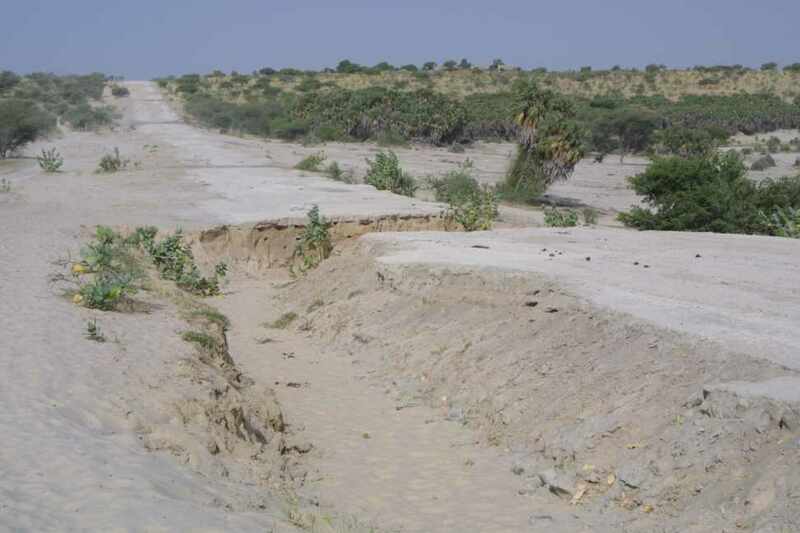 The roads in Chad are easily followed and of reasonable quality, and are signposted in the French fashion. However, rain has caused severe ravines and holes, so extreme care is essential. Whilst on our way to Abeche, we met the Cambridge2Capetown boys (See Links Page) for their website. We stopped for half an hour on the roadside to swap information and experiences with them. On arrival at Abeche, we were escorted to security, where we had 'Vu en passage' stamped in our passports. We camped at the World Food Programme (PAM in French!) rest house that evening. The Cambridge2Capetown boys had advised us to travel to Ndjamena via Mongo rather than the more direct route, which was being repaired. 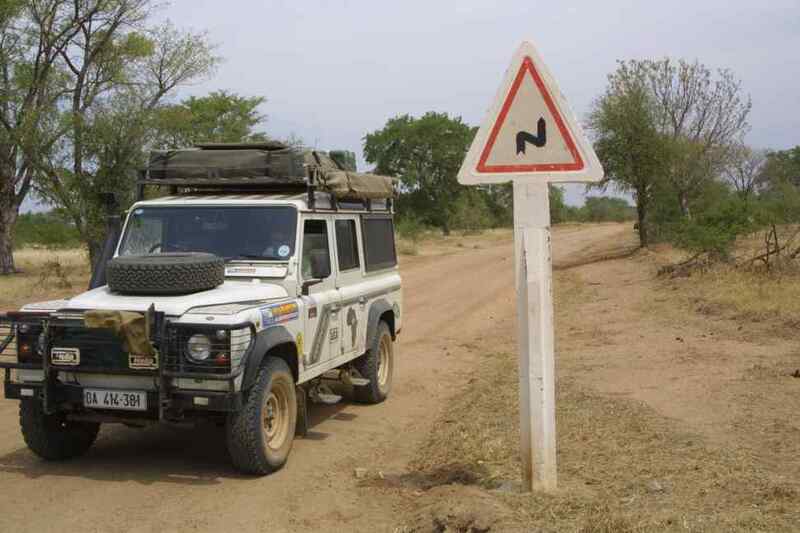 The road to Mongo was marked with French signposts and easy to follow. Initially the road was poor, but it improved to become a good graded gravel track, and all the rain ditches were concrete drifts. We arrived at Mongo at 1pm, low on fuel, with no local currency (CFA). After registration, we were shown where fuel could be bought. Here we negotiated with the garage owner a price of $60 for 100 litres of diesel. Having agreed the price, we filled the car, and duly handed over the money. The owner then complained that we had not paid him the full price. With a gathering crowd, we continued to argue that this was the price we had agreed with him using the calculator to demonstrate, so there could be no confusion. This continued for half an hour, until Adrian decided that we needed the police. 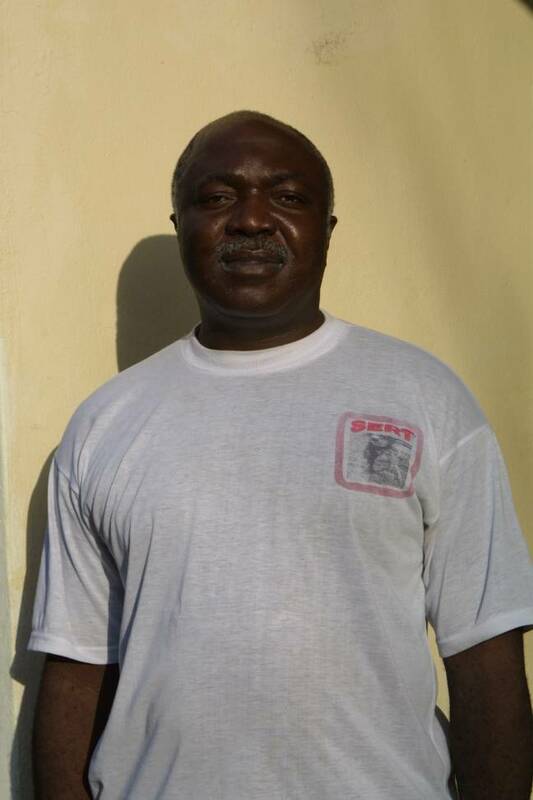 The garage owner went off and returned with Jonathon, a doctor from English speaking Cameroon working with the UN. Our mediator appeared more effective than the police (for afterwards we were told that they would always back the locals in an argument) and he was respected by the garage owner. Jonathan paid CFA 575 per litre, making the effective price $88 (far more acceptable than the $120 we had been asked to pay!). By now it was too late to travel on, and Jonathan suggested we should stay in the UN compound, where he lived. We camped outside his quarters, and enjoyed a pleasant evening in various drinking establishments in Mongo. Jonathan was extremely knowledgeable regarding current affairs and local culture and we very much enjoyed his company. He also helped us to change money the following morning, and ensured we were on the correct road. 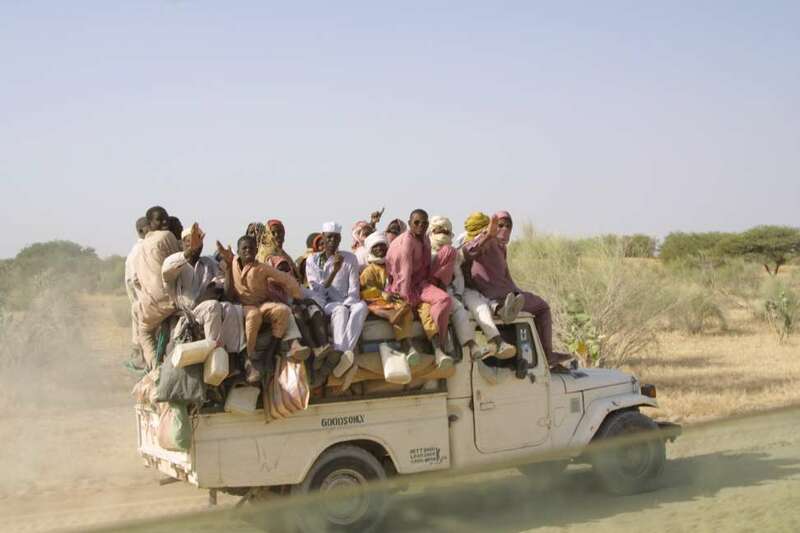 We were told it would take 10 hours to reach N'Djamena. The first 200km to Bokoro were swift along a well graded gravel track (with a few dry drifts to cross, though most of these were thankfully marked - to take one at speed would be disasterous). This section took us 2.5 hrs. Beyond Bokoro the road deteriorated. The dry clay salt pan tracks have baked deep ruts and the route, though easy to follow, was full of twists and turns. We used the side tracks created by previous vehicles. We reached Ngoura after 3 hours, and joined the main road to Massaguet, 125 km more of dry salt pan ruts. 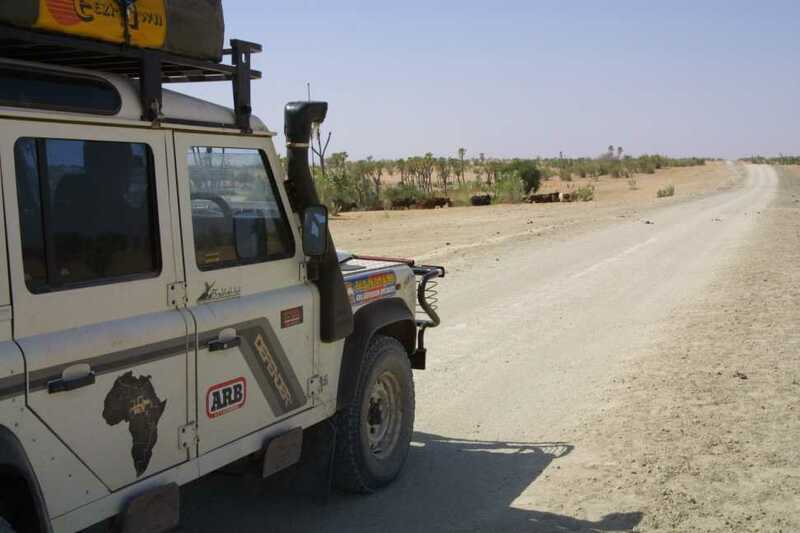 On this route, we hit one severe bump which flipped two of the empty jerry cans out of their cradle and were left hanging by the flexilock from the rear worklamp. 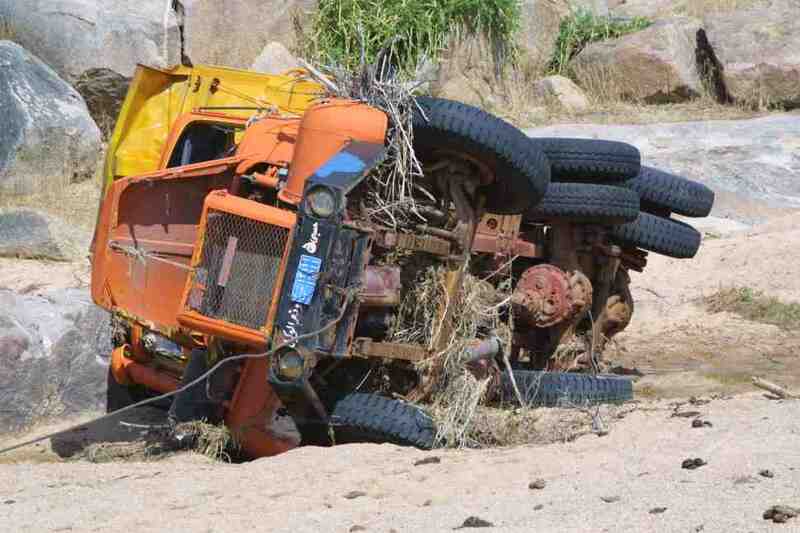 Thankfully no damage was done and Daph's suspension survived the impact. From Massaguet it was 80 km on tar to N'Djamena, although towards the capital the tar has lifted and formed potholes. The whole route took 7 hours. We headed straight for the Novotel, where we were informed we could camp for CFA 2000 per night (although if you use the swimming pool it was an extra CFA 3000). This was a good base from which to work. The next morning we went straight to the Niger embassy, which is not actually situated as marked in the Lonely Planet map, but a few streets closer to town, and quite difficult to find. We entered to find a lady sitting at a table typing on an old manual typewriter. She was very efficient, and said that we could wait for our visas. When we offered the CFA 2000 mentioned in the Lonely Planet guidebook, she explained that it was CFA 25,000, which is comparable to other visas. We also had difficulty finding the Algerian embassy. The member of staff we spoke to there suggested that getting a visa would take at least 2 weeks in Chad, and we would be much better off going to a neighbouring country. So we decided to wait until we reached Niger. We tried to get money out on visa at one of the banks (SGTB) but our card was refused. We learnt later that a request for money on the card had not in fact been made, so we were very frustrated by this. We returned to the Novotel campsite, and Adrian took each of Daph's wheels off in turn to check the brakes and suspension, which turned out to be OK. The following morning we shopped in a local supermarket stocked with French produce. We spoilt ourselves with some pate and soft cheese. We tried to link into the LAN of Sogitel in order to update the website, but were not able to connect successfully, so the technical chap let us use his own ISP in order to connect, and we had no difficulty with the upload. It took us 2 days to get round Lake Chad. We had been told beforehand that the sand was extremely deep, and although it was challenging in some parts, it was not as bad as we had been led to believe. We retraced our steps to Massaguet, and then headed north east for Massakori, on a reasonable graded track. From there, we travelled 120 km to Ngouri along hard baked earth and sandy tracks. Here we turned west for Bol, where again the main track, once graded gravel, had deteriorated though the tracks by the side of the original road were easily passable by 2 wheel drive vehicles. We arrived at Bol at 4pm, and started the immigration and customs procedures. The policeman thought that we would understand his French better if he shouted louder, but after 30 minutes of discussion, including a trip to his commander's house we received our exit visa. The commanders house - or mud hut was interesting - for he and 2 cronies were sitting around on very plush persian carpets under a makeshift shelter - the front lounge. We initially thought they were praying, but there were too many other substances around for such a simple explanation! With exit stamps in the passports, we made for the customs. Although it was late there were two customs officers still at their offices. The offices were pleasantly situated on the edge of Lake Chad. They left us in no doubt that they would be able to stamp our carnet that evening, only if they received a 'cadeaux' for their overtime, or come back tomorrow at 7am. We embarked on a fruitless argument - they denied having the stamp - so even if we paid the bribe, how were they to process the carnet - we left to return the next day, for we would have to camp locally due to the fading light. We were shown the campsite in town, but Bol is a souless place, no privacy as it was on the edge of the camel market and the charge was extortionate, especially for no facilities. We drove out of town to bush camp, but passed an experimental farm complex, within a wire compound. The chef allowed us to camp there for the night, and did not charge us. The following day we arrived at customs at 7.00, as the officers had told us several times that the chef would be there at that time. In the event, he did not turn up until 8 am. Once there, he provided the stamp, and we were on our way. The road north from Bol to Liwa and beyond to Rig-Rig deteriorated into a small very sandy track. We had to engage high range difflock for most of the way, and were lightly stuck once, although Daph was not chassis deep she was not driving anywhere. After twenty minutes of light spade work and placement of the trackmats, Daph drove out easily. We reduced our tyre pressures slightly, which dramatically increased our performance. At Rig-Rig, where the sand was extremely soft, the track leads into the town if you are heading north, however our GPS suggested our exit should be to the west. As with all small towns, getting the correct exit route is the key, so we asked a few locals. Eventually one led us to the police station, where we showed our passports. This delayed us by 30 minutes whilst the policeman laboriously copied our details into an exercise book. We were then shown the exit route, which meant back tracking south before turning west. Had we known, we would have missed Rig-Rig out completely, as our paperwork was already complete. From Rig-Rig we headed due west across sand dunes which again demanded high ratio until we reached some dry salt pans across which we could motor easily. After 100 km, we reached the chad border, denoted by two mud huts and a policeman. He demanded we wait for the chef to complete the exit details, but then he looked at our passports, realised we had completed the formalities, and let us go. Once over the dune, we promptly got stuck again, but were soon free using the track mats. Of the 66 km left to reach Nguigmi, we drove for 20 km before breaking our journey for the night. We were crossing salt pans at this stage, and found a dry river bed within which to secrete ourselves. We ate early just before the sun went down, and were able to make an early start the next morning. 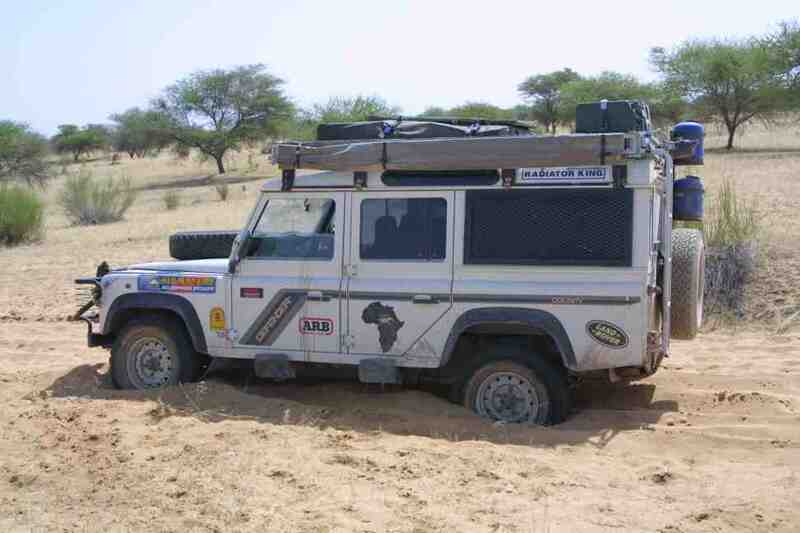 Again, both our Michelin 954 1:1 million and the 'Illustrated Road Atlas of Africa' maps were inaccurate. The 'Africa on a Shoestring' was inaccurate as staed in the text, although the city map of N'Djamena was invaluable. 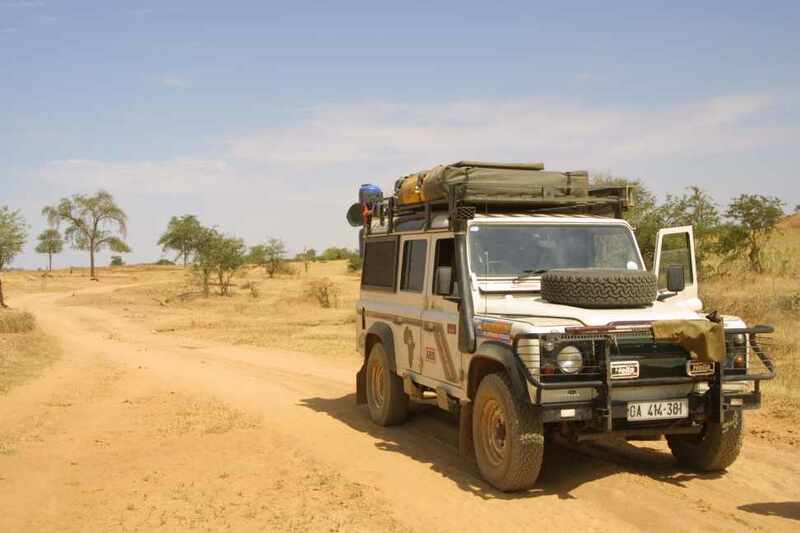 Using our copy of Quo Vardis, we established a set of GPS coord for our route across Chad, which largely worked, although the detour via Mongo was very easy to follow. The French road signs are accurate and helpful. 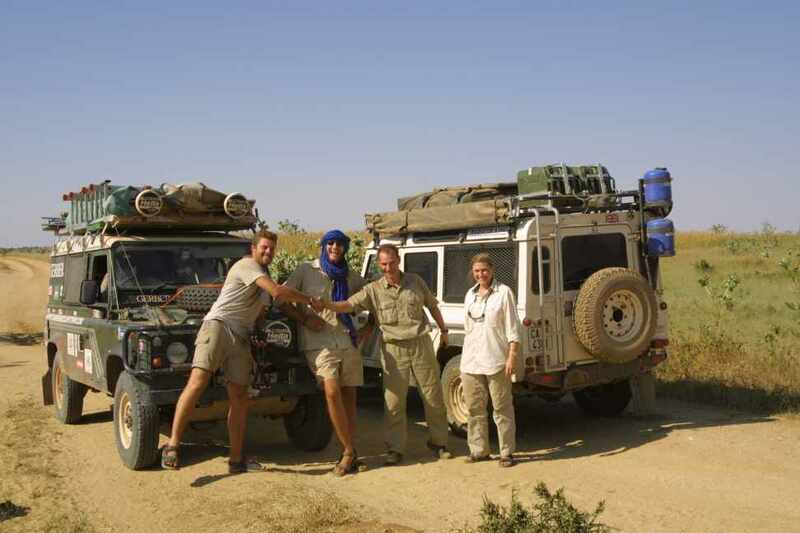 The GPS ccords were a useful check navigation around Lake Chad, which could be tricky, although whenever we asked people for directions we received some sort of help. There was a distinct difference between Sudan and Chad. On crossing the border, we were greeted by a French speaking soldier, and the border formalities were swift and more business like, and also more familiar to us, as things were in French rather than Arabic. However, there was a hard edge to the atmosphere, and the country did not appear as relaxed as Sudan. We found it difficult to identify a tourist focus for Chad. Although we travelled through, and did not have a great deal of time to get a feel for the country, it seemed a rather unsettled place. The capital, N'Djamena, was a colonial town, now in decline. There are wide, tree lined boulevards and shops are now shabby in appearance, and street vendors and rubbish litter the roads. Some of the roads are tarred, but many are uncomfortable sandy tracks. The Novotel appeared to be a focus for white, predominantly French expat community. We were constantly bothered by people asking for money, some of whom were extremely persistent, and there was a general air of discomfort. The constant police checks were irritating although we were able to transit the country in 5 days, and obtained our Niger visas very quickly.